Amorphous solid dispersions (ASDs) have become an established platform to address bioavailability challenges due to low aqueous solubility of new drugs in the pharmaceutical pipeline.1 Despite the clinical and commercial success of ASDs, with 24 FDA-approved therapies, there are perceived risks that may drive the selection of “simpler” enabling platforms.2 These include lack of previous experience with ASDs, concerns on physical stability, and the apparent complexity involving the development of ASD formulations. Here, we will discuss and highlight the most relevant aspects of the latter. 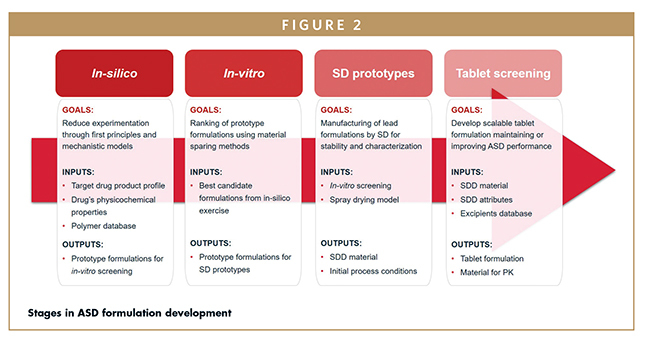 The following discusses the main development goals (Figure 1) and presents a framework for a streamlined development of ASD formulations by spray drying (SD). The use of in-silico tools and miniaturized techniques in ASD formulation screening is exemplified as well as the objective gains in development time and material consumption. Also highlighted is the importance of a thorough understanding of the mechanisms and principles behind ASDs, as well as adequate analytical tools, a science-based methodology, and large-scale manufacturing know-how to achieve an optimal formulation. These aspects are essential to reduce issues and delays during early clinical stages that can ultimately impact time-to-market. At Hovione, the development of an ASD formulation encompasses four main stages illustrated in Figure 2. The first stage consists of an in-silico screening in which the API properties are computed through different models to identify promising stabilizing polymers, propensity for micellization, protonation profiles, and solvent systems. An in-vitro screening stage follows, in which the most promising formulations are evaluated using miniaturized high-throughput tools. The final prototype formulations are selected based on physical stability, manufacturability, and performance based on biorelevant dissolution. The first spray drying prototypes are produced considering material attributes that are representative of potential clinical supplies in larger scales. Finally, the tablet formulation is developed using a data and science-based approach that enables a reduction of lab-scale experimentation, maximizing performance of the ASD and ensuring a seamless scale-up for clinical supply. Among the relevant API characteristics that impact ASD formulation development, solubility in aqueous media, protonation profile, and surfactant micellization propensity are key factors for determining performance and guide the initial development strategy. Cheminformatics tools can be used to generate protonation profiles and assess how the ionic species of a chemical entity is favored throughout different pH values. This will impact the API interaction with the variability of GI conditions, including food effects, and its bioavailability. The inclusion of surfactants in a formulation may also be assessed beforehand to further enhance or extend the supersaturation of the API in the GI tract. High dose numbers are indicative of this requirement. The potential for increasing API solubility by the addition of surfactants is evaluated based on the correlation between molar solubilization capacity and micelle-water partition propensity with a drug’s physicochemical characteristics, specifically logP and Mw.3 Hence, a series of surfactants can be immediately considered in either the intermediate or final drug-product formulation. The thermodynamics component is based on the Flory Huggins polymer lattice theory considering both entropy and enthalpy of mixing. This generates a Gibbs free energy plot where for each polymer, the maximum drug load where mixture of components is energetically favored can be estimated. From such assessment, a small group of potential lead polymers and excipients prone to favourably interact with the API is obtained. 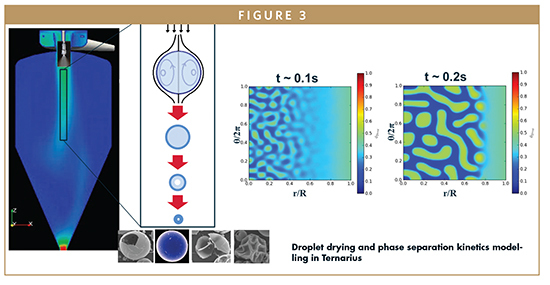 Ternarius further expands this assessment toward the evaluation of drug-polymer phase behavior throughout the drying kinetics observed within an SD chamber where the kinetic entrapment of a drug within a polymer/excipient matrix is modelled (Figure 3). Spray drying parameters then play a key role in accelerating or delaying the drying kinetics and typically, a worst-case slow-drying profile is considered to exclude low-ranking conditions that could result in phase separation and API crystallization. 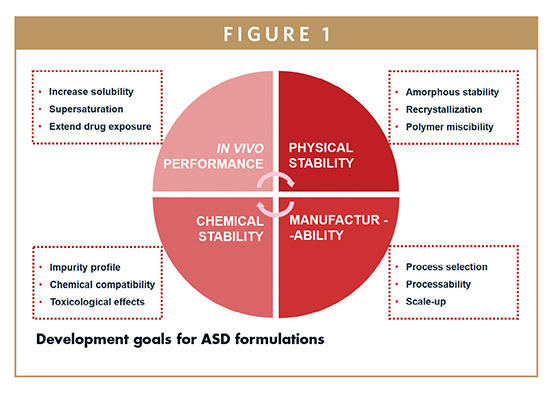 Finally, the solvent system can also play a critical role in the manufacturing and performance of an ASD formulation. To promote a homogeneous molecular dispersion of an API with the selected polymer and excipients, these need to be solubilized in a solvent system with a feasible solids concentration and compatible characteristics to be removed by spray drying. This can be achieved using in silico estimations to narrow down the solvent systems, based on both API solubility parameters and a UNIFAC model. Overall, this streamlined in silico platform allows for a reduction of early stage API requirements, as only a reduced number of promising ASD formulations and solvent systems move forward to in vitro screening. The subsequent experimental stage encompasses two main dimensions, physical stability and dissolution performance of the lead ASD formulations. The experimental work is executed using high throughput and miniaturized methods. At this stage, the work consists of solvent casting experiments and supersaturation studies by solvent shift spiking in biorelevant media. Solvent casting is performed using milliliter-scale solutions aliquoted to differential scanning calorimetry (DSC) pans and polarized light microscope (PLM) glass slides. Solvent casting is a worst-case estimation of physical stability of the faster drying kinetics that occur within an SD chamber, but allows for a quick and efficient technique for differentiating ASD formulations based on their ability to maintain a single phase and avoid crystallization. DSC is used to evaluate the presence of melting peaks (indicative of crystallization) and presence of single and high glass transition temperatures characteristic of stable and homogenous ASD. PLM provides a quick qualitative assessment of the conditions that inhibit API crystallization. Pertaining to dissolution performance, the API amorphous solubility is initially characterized to provide insights into the underlying mechanisms involved in the drug’s supersaturated state and colloidal equilibriums formed thereafter.5 The supersaturation performance of an API is estimated by a solvent shift method aiming at the selection of conditions that extend the API supersaturation window and potentially improve its exposure within the GI tract. The use of computational models with miniaturized in-vitro screening allows the definition of optimal ASD formulations with as little as 3 g API. Ranking of lab-scale screening experiments is then performed and a set of lead formulation conditions selected to move forward for spray dried dispersion (SDD) prototyping at the lab-scale. SDDs are typically produced as small, low density hollow spheres, but by modulating the SD parameters, the drying conditions can be adjusted to yield material with diverse attributes. These attributes will have a major impact on processability and performance. A formulator can engineer the SDD properties to a final target profile of choice by adjusting drying conditions. These will not only impact powder flowability and compactability, but also a product’s final dissolution performance. An illustration of the impact of SDD attributes in dissolution is provided in Figure 4. The HPMCAS-based SDD displays an inverse correlation between dissolution and particle size. Surface area, diffusion, and polymer dissolution kinetics are the main factors influencing HPMCAS dissolution. The second SDD, PVP/VA-based, exhibits an API release mainly impacted by bulk density due to its gelling nature. Disintegration and dispersion of the gelling-polymer-network act as the main bottleneck conditioning its final dissolution performance. Prior to lab-scale prototyping, taking advantage of computational SD models, in which first principles and empirical models are applied to leverage experience in development and commercial spray drying runs, process parameters and drying conditions are selected to generate material that is representative of future clinical supplies. The use of modified, scaled-down spray dryers in combination with a comprehensive SD model for the initial prototype manufacturing is also a determining factor in the success of a development program. Hovione has developed lab-scale spray dryers that replicate the drying conditions of larger units, allowing the manufacturing of SDD with attributes representative of those in commercial scales. This is achieved by replicating gas-liquid intermixing, modulating the thermal profile, and increasing the residence time of the particles in the drying chamber to enable drying of large droplets. This approach enables the fine-tuning and control of SD process variables and SDD characteristics toward a targeted profile of choice that can be easily scaled up. Doing so enables moving through increasing production scales with reduced risk and right-first-time clinical manufacturing without large-scale trials. Failure to account for the scale-up requirements often leads to the need of further development work or even re-formulation that may ultimately delay time-to-market. Common pitfalls during ASD development include the use of excipients and process solvents that are not amenable to large-scale processing, as well as generation of lab-scale material with properties that cannot be easily replicated at larger scales. While avoiding segregation, optimizing processability, promoting disintegration, and ensuring drug release are the key objectives when formulating crystalline drugs, the development of a tablet formulation for an ASD must consider an additional array of variables. From a performance perspective, this corresponds to ensuring that the performance gains obtained in the SDD formulation are kept or improved. Supersaturation must be promoted and maximized, but also maintained throughout the absorption window to ensure adequate exposure. An ASD-based tablet will generally have a dominant influence of the SDD in the tablet properties. The stabilizing polymer in the dispersion will range from 20% to 80% of the intermediate composition. This reduces the applicability of platform-based approaches and leaves little room to improve blend properties through the addition of excipients without compromising patient compliance. The use of an excipient database coupled with mixture models for virtual formulations will aid in the definition of the expected maximum SDD load in the tablet. This approach allows maximization of the drug load in the tablet while reducing the number of prototype formulations to be tested. Promoting disintegration is a requirement for the release of the API from the tablet. The SDD polymers used to stabilize the amorphous state tend to form a gelling polymer network (GPN) that will hinder disintegration.6 Water penetration into the tablet is reduced, and while the disintegrants may induce swelling of the tablet, a slow erosion of the gel will determine API release. A thorough understanding of the impact of the GPN formation in tablet disintegration, as well as the influencing factors, enables the definition of strategies to improve performance without compromising patient compliance, processability and stability. Alternate disintegration strategies, including the combination of disintegrants with different mechanisms of action, may be defined to optimize tablet disintegration and effectively promote API release. Due to the complex mechanisms surrounding disintegration, an empirical approach can be used to address this challenge. The use of empirical models coupled with a formulation database allows for a rational design of prototype formulations without compromising critical aspects of the formulation. This approach can be complemented with more selective analytical techniques to understand disintegration mechanisms and identify rate-limiting steps in the dissolution to guide additional formulation optimization. The low density, hollow spheres, obtained by spray drying will generally exhibit poor flowability. This results in variable die-filling performance in a tablet press and large weight variability. The use of a granulation step will often be required. The more common wet granulation methods are avoided with ASDs due to the risk of crystallization; dry granulation methods, specifically roller compaction, is usually preferred. Dry granulation will improve flowability and allow a robust compression operation. On the other hand, the compressibility of the blend will be reduced upon the initial compaction of the roller compaction. The polymers present in the SDDs present good compressibility, but the decrease in compressibility may change the required solid fraction to achieve the target tensile strength up to a point when disintegration, and consequently drug release, are negatively impacted. The final selection of dry granulation conditions must account for all these factors, where both processability and performance are considered. Addition of functional excipients should be considered when the dissolution performance is below required. Excipients to be assessed for ASD formulations include surfactants, crystallization/precipitation inhibitors, and permeation enhancers. Selection of surfactants will follow a methodology similar to the one described for the ASD screening stage. Precipitation inhibitors may include polymers from the ASD screening stage that were excluded due to low physical stability of the ASD. 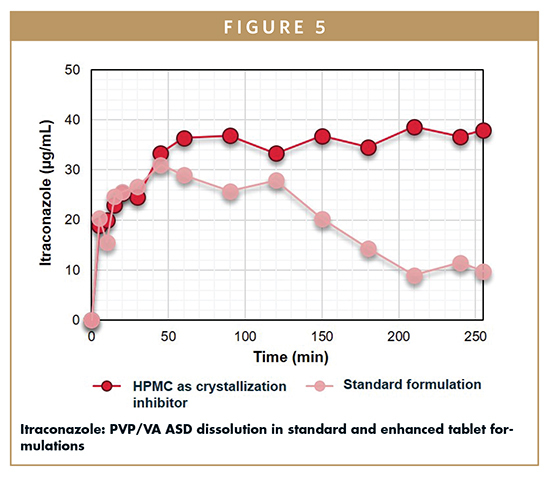 An example of the use of crystallization inhibitors is provided in Figure 5 for an itraconazole-PVPVA ASD tablet. The addition of HPMC to inhibit crystallization extends the supersatured state and improves the potential exposure of the drug in the GI tract. The use of compaction simulation for material characterization and formulation screening is gaining increased attention and presents significant advantages in the case of ASD formulations. Besides the reduction in material consumption during early compression trials, the plastic-deforming polymers used for stabilizing ASDs typically exhibit a dwell-time and strain-rate dependent behavior. The behavior translates into differences in compression profiles and elastic recovery for different compression conditions. Together with a data-based methodology for prototype formulation screening, the use of compaction simulation enables a thorough formulation development, in which a final formulation can be defined, complying with target requirements for processability and performance, while reducing the time and material required for experimental work. In this paper, we described an integrated approach for the rationale and development of ASD formulations and processes. The use of science and data-based methodologies was described, as well as the advantages when compared to purely empirical or experimental approaches. The importance of integrating all steps in formulation development and taking into consideration the requirements and constraints of large-scale manufacturing was also highlighted as key for right-first-time development. The described strategy reduces overall risks in a development program and ultimately reduces time-to-market. With the described approach, and using as little as 30 g API, a fully optimized ASD-based tablet prototype for a PK study can be made available within 6 weeks of initiating experimental work. The use of best-in-class methodologies ensures that scale-up risks are minimized and that the performance of the ASD formulation is maximized for optimal exposure and bioavailability. Lipp R. The Innovator Pipeline: Bioavailability Challenges and Advanced Oral Drug Delivery Opportunities. American Pharmaceutical Review, 2013. Jermain SV, Brough C, Williams RO 3rd. Amorphous solid dispersions and nanocrystal technologies for poorly water-soluble drug delivery – An update. International Journal of Pharmaceutics, Volume 535, Issues 1–2, 15 January 2018, 379–392. Alvarez-Nunez FA, Yalkowsky SH. Relationship between polysorbate 80 solubilization descriptors and octanol-water partition coefficients of drugs. International Journal of Pharmaceutics, May 2000, 200(2), 217-22. Duarte I., Santos JL, Pinto JF, Temtem M. Screening Methodologies for the Development of Spray-Dried Amorphous Solid Dispersions. Pharmaceutical Research, January 2015, 32(1), 222-237. Sousa LA, Reutzel-Edens SM, Stephenson GA, Taylor LS. Assessment of the amorphous “solubility” of a group of diverse drugs using new experimental and theoretical approaches. Molecular Pharmaceutics, February 2015, 2 12(2), 484-95. Démuth B, Nagy ZK, Balogh A, Vigh T, Marosi G, Verreck G, Van Assche I, Brewster ME. Downstream processing of polymer-based amorphous solid dispersions to generate tablet formulations. International Journal of Pharmaceutics 486 (2015), 268–286. 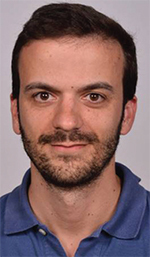 Dr. Paulo Lino earned his Master’s degree in Pharmaceutical Sciences at the Universidade Lusófona and his PhD and Post-Doc in Pharmaceutical Technology at the Faculty of Pharmacy, Universidade de Lisboa spanning areas from biopharmaceutical formulation/engineering, freeze-drying, and particulate polymeric drug delivery systems. In 2017, he joined Hovione at the Drug Product Development group as a Scientist and has been involved in projects that range from multivariate formulation screening and development to the tech-transfer and scale up of several solubility enhancement and particle engineering projects. João Henriques is a Biological Engineer by training. He specialized in process monitoring and control for pharma and biopharma processes before joining Hovione in 2008 as a PAT specialist. He has been working as a Formulation and Process Development Scientist since 2013. He has supported development and validation of spray drying, jet-milling, roller compaction, and tableting projects. 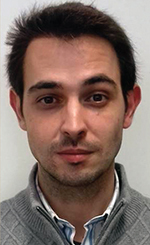 He is currently the Team Leader for Particle Design and Formulation at the Drug Product Development Group.